When asked to write this article, I thought and prayed about the content. As a stepmom, the owner of Stepfamily Rx, and as an author and blogger, I decided that there is a lot of information out there about “how to” and perhaps not enough about encouragement for all the good, powerful, and positive attributes of living as a stepfamily. So, within this article, I’ve shared some tips and “bravos”. There are statistics that indicate when children grow up in a safe, positive, and healthy stepfamily with good rapport between biological parents, they can prosper and flourish as adults. Children need to feel loved, wanted, and respected. When emotional, physical, and spiritual needs are met within a stepfamily, everyone can relax and prosper. I realize things can be difficult, but I know there are happy times out there, too! I am reading an exciting book by Shaunti Feldhahn entitled “Good News About Marriage”. In eight years of extensive research and reading numerous surveys, she has found that marriages hit a divorce peak in 1981, but since then have been on the decline. The higher statistics for remarried couples suggest that there are different situations that can cause stepfamily marriages to struggle or falter and fail. However! The high statistics repeated by many for redivorce in stepfamilies is inconclusive (62-65% for 2nd marriages, 75-78% for 3rd marriages). Shaunti found that the divorce rates are much lower that what people have previously believed. It is true when issues are addressed from a more positive perspective, hope and endurance can reign. Marriage is a GREAT thing, and THAT is what we should be repeating! In Ms. Feldhahn’s book, she states that her findings indicate that couples who pray together and regularly attend church and worship services have a higher success rate with happiness and longevity in their marriages. God created us for relationship with Him and with each other. Therefore, having God as first and foremost in your family establishes the relationship harmony…everyone has their focus on loving and serving God instead of dwelling on selfish desires. That’s why in my book, “Everything Changed When I Said ‘I Do’ – Preparing for and Living as a God-First Stepfamily”, I propose ‘The Marital Perch”, which indicates that under God, husband and wife occupy and exist on this perch alone. Under the marital perch are the children, and under the children, everyone and everything else. This hierarchy is critical and essential, especially in stepfamily homes. Husband and wife must put each other first as the authority in the home for the sake of the children. It’s not easy, but it is important to the success of the family! The good news in many stepfamilies is the husband and wife’s desire to create something better after a painful decision or event that put an end to the original family. I talk to many stepfamilies that pray together, are involved with school, activities, sports, music. They attend worship together, spend time playing, and make every effort to successfully plan holidays. Stepfamilies create new memories, new histories, and new traditions, while respecting what is important to the children. Avoid expectations, avoid taking everything personally. Celebrate good days, learn from difficult ones. A decisive action parents and step-parents can take is to be genuinely committed to communication between each other. Seek to understand first, then to be understood. I recommend any disagreements about the children between the spouses never take place in front of the children. It gives them a peek at any issue or weakness between the adults. Strive for peace, calm, and safety. We cannot control other people, we can only control ourselves. When you avoid negative talk about anyone, you teach the children a very important life lesson about relationships. I know of stepfamilies that strive to have friendly relationships with the ex-spouse! It can and does happen! Take time for weekly “table talk”, when everyone checks in with each other, schedules are discussed, and highs and lows can be shared. Adults and children take turns, keeping the tone respectful. Create a family mission statement wherein each person in the family contributes. Finally, make a list together during your family table talk time of fun, new, enjoyable things that happened during the week and post it on the refrigerator. Each week you can do a new one. Now, I’ll bet after reading this, you realize that there are successes in your stepfamily, that you ARE doing some things right! Life is too short, so rather than just survive….you can thrive! God bless ALL families. “I think the main thing was the love my dad always gave me. (I don’t like to call him stepdad and never did) He was never known that way to me, though I always knew I had a biological father–who my mother communicated to me didn’t want me to be born. Somehow having me didn’t help her first marriage and held her back from fulfilling her dreams–lots of responsibility felt as a toddler. When my mom and “dad” (how I will refer to your term stepdad) got married, I was 2 and I asked why my last name was different and that if I wasn’t a Smith, I wasn’t part of the family–don’t ask me how a 2-yr. old comprehended that, but I did. So, I got to go by Smith and was very happy about that. Later, I legally took the name (at 20) though I’d always gone by Smith and my “dad” was so happy and proud. He never made a difference, at least that I noticed, between my brother and I (and I could never think of my brother as a step) He’s just always been my brother. These early impressions somehow set me up to be a pleaser much of my life so people would want me around . I had come to believe, at some level, I might not have truly been wanted, so I’d better be a really good girl and do what others told me. It’s taken me most of my life to overcome this, with the Lord’s help, and not allow myself to be dominated by others. It’s also important for parents, be the bio or step, to try not be negative about the other parent as the child picks up on that, even very very young. Because of my mother’s hurt, I only heard negative and rather awful stories about my bio dad and as a little child that came across that I must also have these bad qualities–another reason I must “please” others so they would like and value me. Another strong memory is of a 4th grade teacher who put both my last names up on the school wall–she had all the kids’ names up and proceeded to call them out (like a roll call) and when my birth name came up and I didn’t respond, she asked me “Didn’t I know?” “Don’t you know who you are?” It was a rather mortifying experience for a 9 year old, but none of the other kids seemed to pay much attention. I was an adult before I even told a friend my “dad” wasn’t my biological dad–He’s always been and always will be my “dad” to me. When I saw my mom on my birthday this year and she asked me what I wanted to do, I said that I wanted to visit “dad’s grave” and put flowers on it. We sat on the grassy hillside and sang the old gospel and family hymns I remembered from growing up. My “dad” was always there to encourage me, believe in me, and always had wise words and common sense advise. He never once raised his voice to me or even got mad at me that I remember, but I was a pretty good kid. His life continues to inspire me to live well. 6th Annual Stepfamily Rx LIVESTREAM! BLENDED & BLESSED LIVESTREAM EVENT FROM MINNEAPOLIS, MN! Register Online for Blended & Blessed Livestream! Register for Blended & Blessed! 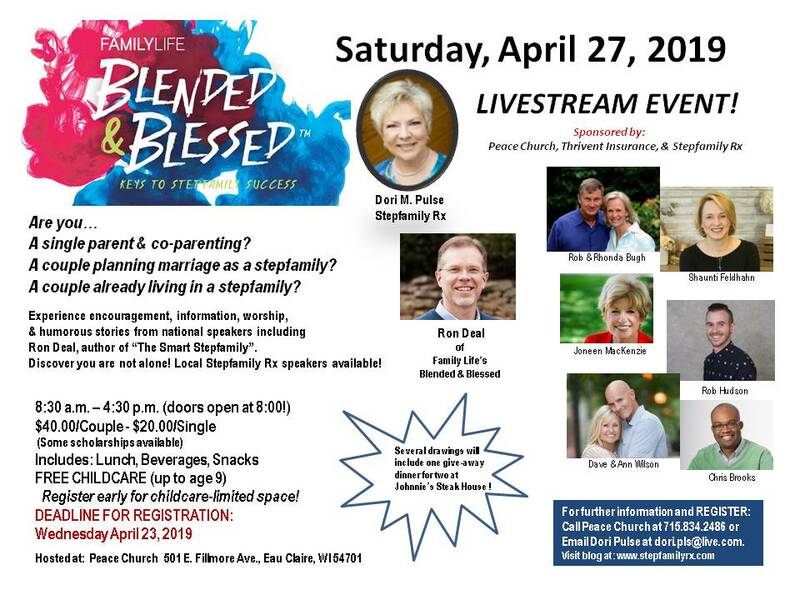 BLENDED & BLESSED LIVESTREAM COMING! My Interview Podcast – Check it out!! Blended Hope on People are Hard Work! Jesus-Network.com (G… on Jonah and me…. Randi on This is How God Works!